According to Protestant Christian tradition, this tomb was the place of burial and resurrection of Jesus. It’s known as the Garden Tomb and was designated as the holy place in the late 19th century based, in part, on the skull-like features in the face of a rocky cliff nearby. All four Gospels in the New Testament name the place of Jesus’ crucifixion as Golgotha (from the Aramaic for Place of the Skull). (Some translations use Calvary, from the Latin for skull). The Garden Tomb is an alternative to the area identified by Helen, the mother of Constantine, in the 4th century and enclosed in the Church of the Holy Sepulchre. This mystery country is Israel. 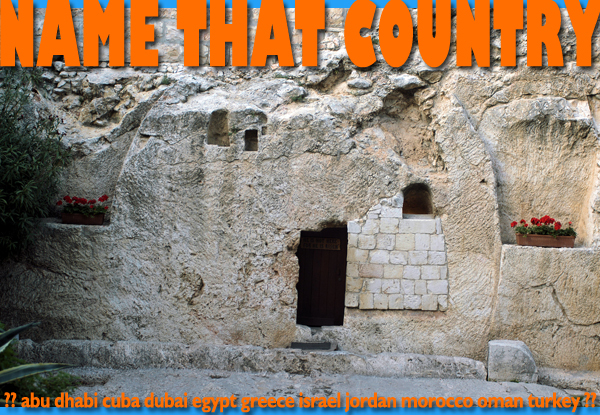 This entry was posted in Israel, name that country quiz by yalla2013. Bookmark the permalink.